All right. You have decided to start powder coating. For most of you, this is an exciting and scary time. 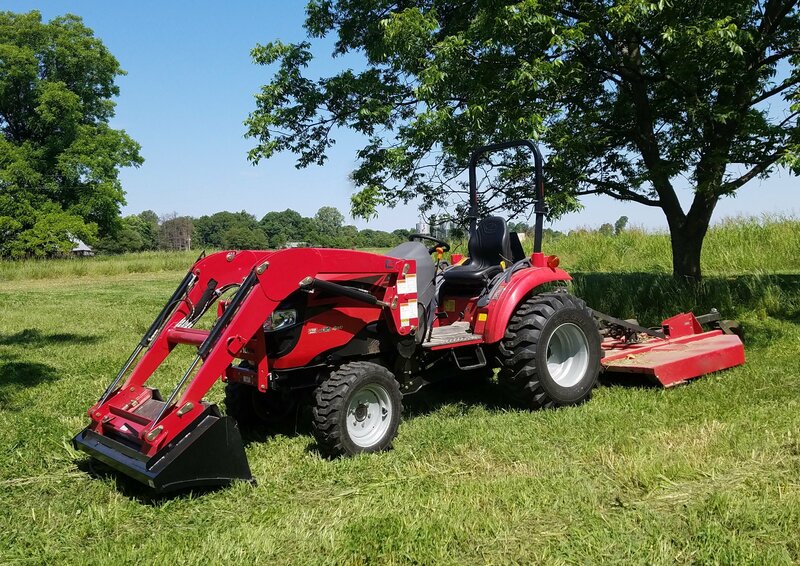 With the purchase of the powder equipment and the arranging of where to put it, you probably haven’t had a lot of time to think about the small stuff. So this article will give you some basic supplies tips that will get you coating faster. There are also so industry specific supplies or requirements to consider, but that will be at the end of the article. Some supplies are fairly self-explanatory. If you are blasting to clean your parts, you will need some sand, garnet, or shot to run through the machine. Don’t buy a lot at first of any specific brand or size because you might wind up switching materials after a week. Buying the minimum amount to test your cleaning process is usually the best idea. The same goes for pretreatment chemicals, if you plan to use them. Most suppliers of chemicals will sell you a small amount to try before you commit to a large order. Sometimes they will even provide small samples for free. It doesn’t hurt to ask for a free sample. After you have decided how to clean your parts, you will need to hang them in order to transport powder coated parts from the powder booth to the oven with out rubbing the powder off. Racks can be purchased or home made depending on your metal fabrication skills. If you are buying or making, the most important part of a rack is the wheels. Make sure you have metal casters at the bottom of the rack, that can withstand 450 degree heat. Order or make enough racks that you have at least one rack per finishing step. One in blasting ready for loading, one in the powder booth, one in the oven, and one in cool down or in your off load area. You don’t need that many to start powder coating and you may want to test one or two rack set-ups before you commit to buying or making four or more. While you are experimenting with your rack design, try some different hooks. Get some samples from hook manufacturers or make some hooks using some bar stock and a wire/pipe bender. Most manufacturers do not use the first type of hook they try. You want a hook that will not get in the way of the powder, that will support the part, and be conductive for a proper grounding of the part. Plan on replacing or cleaning hooks every 5-6 uses. The reason for that is to keep a good ground on the part so that the powder does not fall off easily when moved or when a draft of air hits a powdered part. Air cleanliness is very important to powder coating. Make sure you have a good oil/water separator on your incoming air line to make sure the powder is clean before it hits your powder gun and the powder that is being applied to your parts. A dedicated compressor with an air drier is ideal, but a decent filter on your air line will stop moisture from hitting your powder. Now that you have clean parts on racks, they are ready to be powder coated. Most new powder coaters start with polyester powder coating. Polyester powder is user friendly, durable inside and outside, fairly inexpensive (except for wild colors and effects), and cures in an oven reliably without a lot of fine tuning. All powder companies have standard color cards that you can order from that cover most industry colors. If you know exactly what powder you will be using, then get a weeks worth of production quantity at a time. Most powder companies have 2-3 days shipping times on standard colors. While you are ordering powder, don’t forget to get some extra booth filters. One set of the first layer of filtration should do, be they filter squares or blankets. The other filters like bag or HEPA filters should not wear out very fast and can be ordered when needed. Remember not to “blow out” dirty filters with compressed air. That will cause holes in the filters and allow powder to get to the secondary filters faster than it should. Although the booth will pull most of the powder into the filters, operator masks are still required. 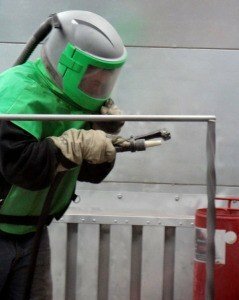 According to the Occupational Safety & Health Administration (OSHA), Washington, powder coating workers must wear no less than what is called an “N95,” NIOSH-approved respirator (otherwise known as a dust mask). Depending on the powder gun you have purchased, there will be different wear parts to keep on hand to keep you gun spraying properly. 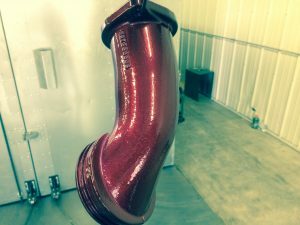 Powder pump(venturi) nozzles, gun tips, and extra hoses are the most common extra powder coating gun supplies to keep around. The nozzles are near the pick-up tube and are necessary to keep the powder flowing without surging. They are plastic, so powder will eventually wear them out by cutting into the side. If you see a groove being cut into a nozzle or if the nozzle starts to look oval in the middle, change it out. Gun tips typically don’t wear out, but operators do drop guns accidentally so it’s a good idea to have a spare or two. Hoses can get holes, be run over, get cut, or be melted by a hot rack. I’d have a couple around just in case. Some folks keep an extra set of hoses for color changes. While you are in the powder booth area, there are a few other things that might be good to have around. Silicone plugs and high temperature tape will keep powder out of areas or off surfaces that you don’t want powder coating on. Bolt holes and friction surfaces are a couple of places you would want to keep powder away from. A box of cheap ear plugs are good to keep in the powder area. Safety-wise it’s a good idea to wear ear plugs in a noisy environment like a spray booth. Unused ear plugs are also great hose scrubbers for using between color changes. By using compressed air, you can shoot an earplug through a powder hose to “scrub” stubborn powder off of the interior hose walls. Before you start moving racks in and out of the oven, you will want to invest in some high temperature gloves or mitts. 400 degrees F is pretty hot and will burn you if you don’t take precautions. Keep some high temperature grease close to grease the bearings of the fan in the oven. After your parts have cooled down from being baked, it is a good idea to regularly check your finish to make sure it meets your quality standards. The easiest test is an MEK rub test. 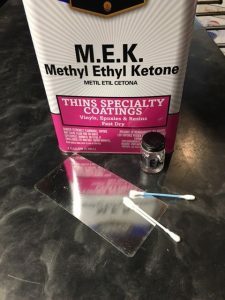 By getting some MEK and some q-tips, you can spot check your parts to see if you are getting enough cure. 20 double rubs will let you know if you have enough cure. Adhesion testing is also done fairly easy although you will want to check it on a scrap piece of metal instead of a part. Use a utility knife and some sticky tape to do a cross cut with about 5 cuts each way. Apply the tape to the cross cut and then pull up the tape. If any squares come up you need to look at your metal preparation or your cure. The final tool in a basic quality control box is a dry film thickness gauge. Be sure and get one that will measure steel and aluminum. Checking powder thickness is important for ensuring durability and to reduce unnecessary powder waste. Those are the basic supplies or additions that every industry should think about incorporating in their process. Next up are some additional supplies or different materials that you might need for specific industries. All architectural aluminum finishes will have to be pretreated with a Zirconium based pretreat and something to take off the oxidation of the aluminum. The powder used for extruded aluminum is usually of two different qualities. The first is Superdurable Polyester AAMA 2604 quality. This is what most architects will specify for the exterior of buildings. KYNAR® AAMA 2605 quality is the most durable exterior powder for powder, however, it is very specific on how the pretreatment must be applied. KYNAR® can only be applied over an automatic pretreatment system specially designed for these 10-30 year warranty finishes. Since the warranty is so extensive, an on-site boiling water test is usually added to the quality control daily checks. A color computer or unit is usually required because customers need verification that the parts produced will match other components done at different manufacturers. Heavy equipment suppliers usually will need upgraded exterior durable finishes. This starts in the pretreatment. While a one stage pressure wand may work in most cases, there may be additional steps depending on the end customers specifications. 3-5 stage systems may be needed to insure proper salt-spray requirements. A wash stage, rinse stage, phosphate (iron/zirconium/zinc) stage, rinse stage, and sealer stage is a common set-up. Additional testing like impact or salt spray are usually done on-site or by the powder suppliers lab. Powder coating industrial pipe is an interesting process since they usually heat the pipe to curing temperature and then spray or dip the pipe with powder. This uses a specific kind of powder called Fusion Bonded Epoxy powder. Since the pipe goes underground, the epoxy gives the best durability versus rust, chemicals, and moisture. However, if the pipe is exposed to the sun, polyester powder will have to be applied over the epoxy to keep the coating from degrading due to the UV rays. Marine equipment like cranes on ships are the toughest environments for any coating to survive. Daily exposure to salt water and extreme temperature changes can wreck any finish. The pretreatment will have to be a 5-7 stage zinc phosphate system followed by a zinc-rich epoxy powder primer. Then a urethane topcoat will be applied to allow the best flexibility and UV resistance protection available. This is not a cheap system and will need regular salt spray and QUV testing by the manufacturer or their powder supplier. Automotive part manufacturers are usually grouped into under-hood part and exterior part suppliers. Under-hood parts are usually coated with epoxy powder due to the great chemical resistance epoxy provides. Since chemical resistance is so important, regular watch glass checks with hydraulic and brake fluid are not uncommon. 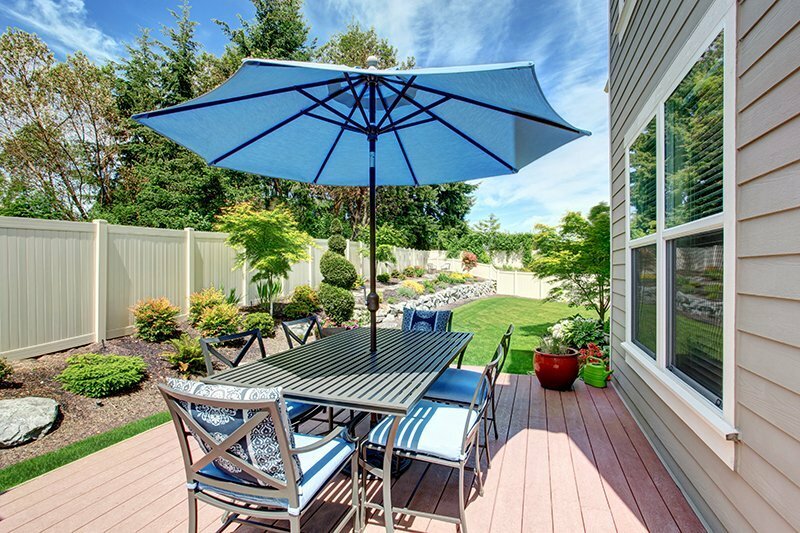 Exterior parts are usually urethane or superdurable polyester powder. Gloss and color are very important for automotive manufacturers so daily gloss checks with a gloss meter and color checks from a color unit are usually required. Flexibility and dent resistance is also checked by having impact drop testing and a conical mandrel bend test. Military powder coating is fairly new. They have a two coat system usually starting with an epoxy powder primer and a CARC powder topcoat. CARC stands for chemical agent resistant coating. It is designed to be resistant to chemical warfare chemicals and also aids in the decontamination process if the vehicle is exposed. All the parts need to be pretreated with zirconium. A gloss meter is usually required to make sure the low gloss is within standard. Developing your supplies list to tie into your powder process. Don’t be afraid to try different suppliers or qualities of each item. All of your supplies should contribute to a more efficient process and a quality finish. Try and compare each item apples to apples to see how much use you get out of it and if it helps your end customer. Keeping good notes on when you used an item and how much life you really got out of a particular spare part will guide you on keeping costs low and quality high. Outdoor equipment is one of the largest and fastest growing markets for powder coating. 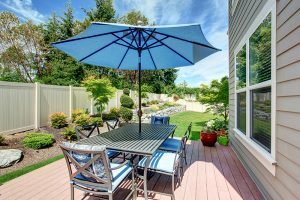 This is no surprise, since powder coating outdoor equipment makes good sense for both equipment builders and their customers. 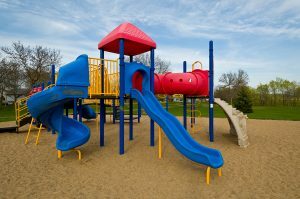 From playground equipment to sporting goods, powder coated outdoor products last longer and perform better. In this article, we’re going to look at how powder coating systems reduce costs and produce a better outdoor product. Almost all metal products that are going outside need to be finished in one way or another. Preventing rust is one of the main reasons that metal coatings were invented. Properly prepared, a finished metal object will outlast an unpainted one. So, why is a powder coating system better than wet paint methods for outdoor equipment? The simple answer is that powder coating is cheaper to apply and typically lasts longer. A single coat of powder is just as scratch-resistant and durable as a multi-stage wet paint application. Yes, automotive paints can last as long, but those types of wet polyurethane are coatings are expensive and require more steps. First, you have to properly prepare the metal, then prime it, then apply a two-component color coat, and finally apply a clear topcoat. The material cost alone is usually four times that of powder – to get a similar result. Not only are raw materials cheaper using a powder coating system, but there’s less handling and preparation of the parts! Powder coating is much easier to apply than wet paint. Since powder is simpler to apply, painters will produce fewer flaws, such as sags and runs. They will also need less practice. The average cure time for a metal part is about 20 minutes to bake and 10-15 minutes to cool, so you can typically handle, assemble and pack your parts much faster than when using a wet paint method. What about durability benefits in powder coating outdoor equipment? 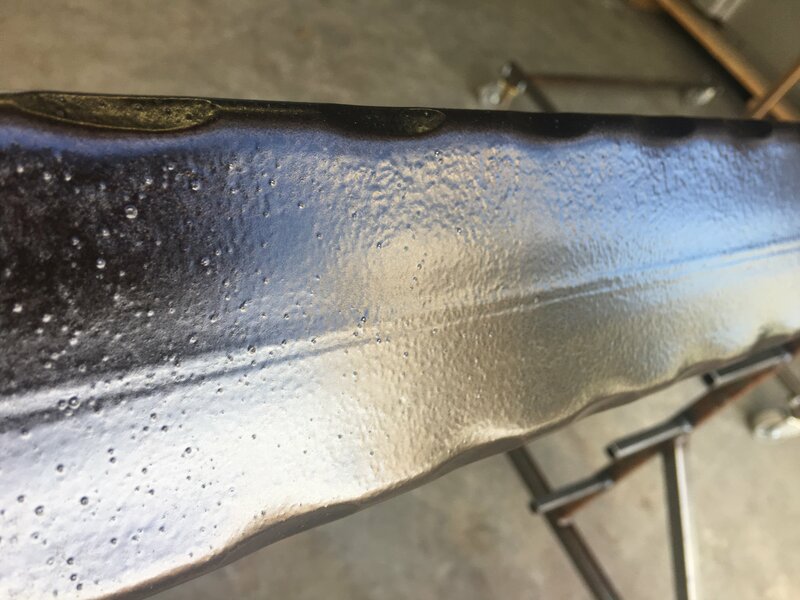 Since rust is usually our primary concern, what kind of resistance to corrosion does powder coating provide and for how long? Perhaps we want to determine how resistant a coating is to corrosion. We can use a common industry test called Salt Spray Testing. This simulates extreme outdoor conditions by spraying a coated part with pressurized air and saltwater. 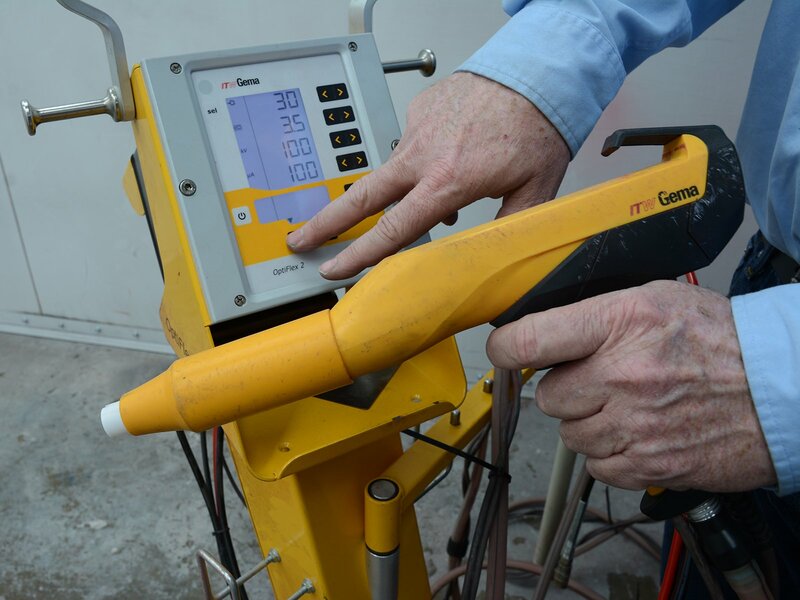 The salt spray test is used to determine how long a finish might last before rust and corrosion compromise its integrity. Start with a coated sample part. Scratch the coating all the way through to the metal in an X pattern. Blast the part in a testing chamber with 5% or higher salt spray solution. Time how long you’re spraying. When rust has reached 1/4″ or more from the scribed point, stop spraying. How much time has elapsed? Compare this time to other coatings’ times. with no other preparation or special treatment – lasts on average five times longer than the same object finished with a common wet paint. Salt spray testing is a controllable lab test that simulates tough conditions to determine overall finish performance when powder coating outdoor equipment. However, many variables will affect true performance. This test gives only a rough estimate of how resilient any finish is. If you use powder coated equipment on the Florida coast, 100 hours could equal one month. But if you are in Arizona 100 hours could equal 15 years. Climate, local weather patterns and equipment usage all play a part in how long your finish will last, but the more salt spray hours your part takes to rust, the better. 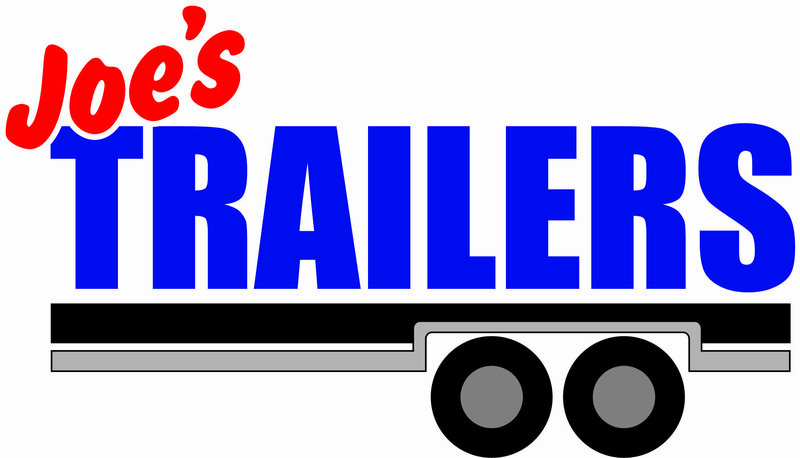 Joe’s Trailers is a sample business that wants to provide its customers with durable products. 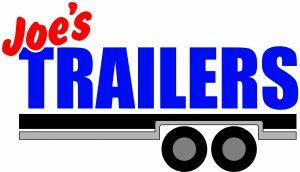 Joe’s Trailers can show how a typical small manufacturing business can easily change its methods to get better results from powder coating outdoor equipment. But, Joe sometimes needs to store the trailers outside for a long time. He also sells them in areas where road salts are used. 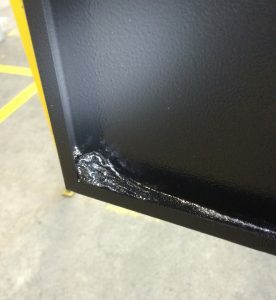 The wet paint finish on the trailers isn’t lasting, and customers complain. Joe decided to purchase a powder coating system to increase quality and reduce material costs. He kept the same preparation. But with his new powder coating oven, he got 250 hours of salt spray before there was a ¼ inch of rust creep with the powder coated finish (Process 2 from Test Results above). This was five times longer than with his wet paint technique. That’s a level of protection so thorough that no trailers rusted in his storage lot while they were stored outside during the off-season. Joe got a call from an upscale landscaping company located near Chicago. 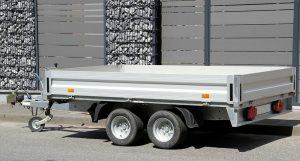 This customer wanted his trailers to last longer than the current trailers he bought from a local home improvement store. 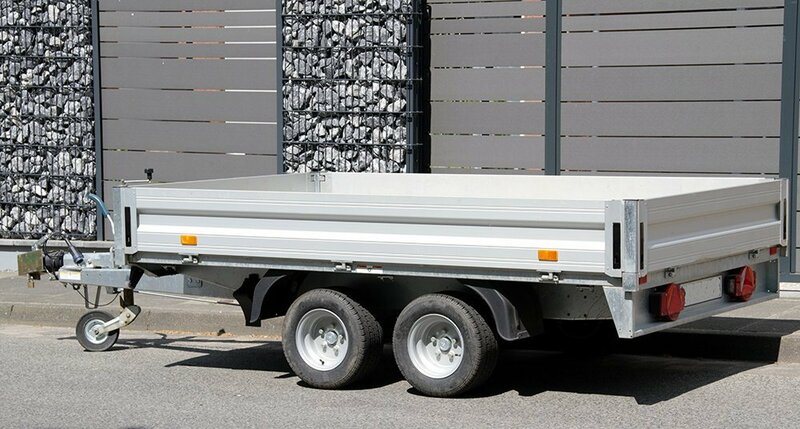 The customer couldn’t use ugly, rusted trailers in his service area because of his demanding clients, and the winter road salt quickly corroded his trailer fleet. Joe decided to make some improvements to his powder coating system. He already had a powder coating spray booth and powder coating oven. He decided he could improve his pretreatment. Joe invested in a blast booth, and a special pressure washer that generates steam. This new piece lasted 1000 hours in the salt spray testing chamber before the rust creep reached 1/4 inch (Process 3 from Test Results above). Because the finish was so durable, Joe was able to offer a four-year rust warranty. He increased his prices to cover labor and equipment. He even got more profit from these upgraded trailers than his basic trailers. Switching to a powder coating system can greatly increase coating performance and durability. Consider it especially for products that must suffer the wear and tear of outdoor use. Products will last longer in outdoor conditions. Business costs like product storage damage, customer returns, and premature warranty issues will be reduced. Finally, higher prices can be charged for better products. Handrails, fences, and playground equipment. Seasonal items like fishing and marine equipment, deer stands, and much, much more. When taking on a new powder coating project, remember to ask your customer what they need. Get the correct coating procedure in place to meet their expectations. Use your vendors as resources to help you tailor your powder coating equipment, powder, and pretreatment methods to exceed your customers’ needs. This entry was posted in News on May 24, 2017 by Bruce Chirrey. When troubleshooting your powder coating, you may find specific issues caused by the powder coating particle size. Unfortunately, while a lot of information is available on this subject, most of it is very technical in nature and doesn’t explain the real-world production issues that are caused by improper powder coating particle dispersion. If you’re looking for practical knowledge to improve your results, these basic guidelines will help you identify finish problems related to particle size. When powder is manufactured, it is combined in a giant mixer, melted, cooled into a big sheet, and then broken up into pieces. It is then ground and sifted through a screen to the specific particle size the powder manufacturer has designated. During the manufacturing process, there are three types of particles produced: standard, fine and large. Standard Particle: This particle size is what the manufacturer wants to put in the box. The size range of the particle is very tightly controlled, Standard particles will produce the best possible finish and generate proven, heavily tested results. Fine Particle: This particle is very small and could cause some finishing issues like picture-framing if there was too much allowed to be packaged. 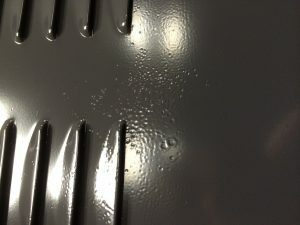 The fine powder particles build up at a different rate from the standard particles, especially in areas of “wrap”, and cause unacceptable variations in the finish. An excessive amount of fine particles can also contribute to application guns spitting or sputtering because fine particles can be fluidized more easily than standard particles. During the grinding process, powder manufacturers have suction hoses above the grinders to catch a lot of these fine particles that would not otherwise be sifted out. Fine particles, by nature, float in the air more than standard particles. That’s why the suction hoses can catch most them. Some fine particles and some large particles will wind up in the powder box regardless of the process being used. 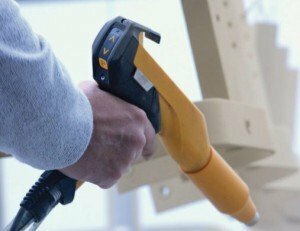 The powder coating manufacturer has a particle size distribution analysis machine to measure samples of powder and see how much variation the powder particles have. In a normal box of powder, there shouldn’t be enough large or fine particles to cause problems. 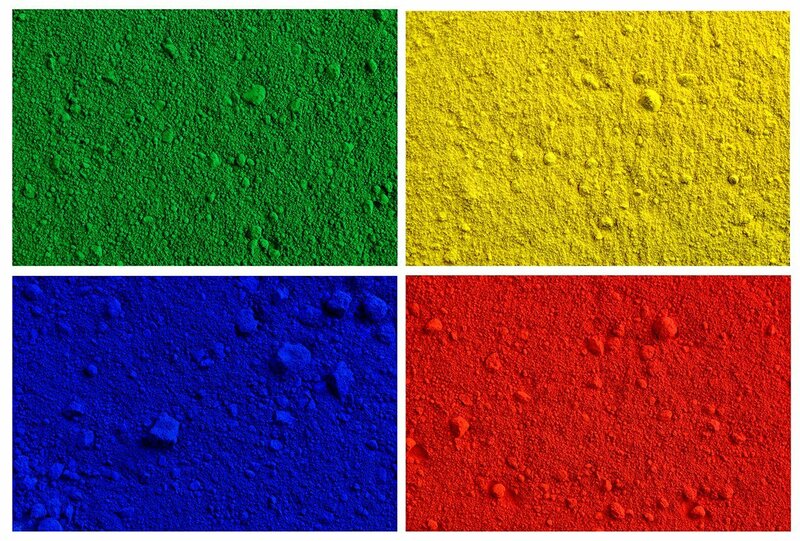 Typical distribution of powder coating particle size in different powders. What Is The Powder Coating Particle Size Supposed To Be? There is no standard answer, because each different type of powder has specific particle size requirements due to the special effects components or pigment used in its formulation. Regardless of size, the key to good powder is generally to have as tight a particle size spread as possible. Typically, smaller particles carry better charge and fill voids in the coated surface better, but they do not penetrate Faraday Cage areas well. To get a powder that both holds a charge well and creates an even distribution, the manufacturer will usually decide on a happy medium for the average particle size based on laboratory and sample production testing. As you can see, there is a curve to the distribution. That means that some particles are a little bigger and some are a little smaller. The more peaked the curve is, the more reliable your finish should be. If the curve is flattened and you have a lot of fine particles or large particles, you could have more finishing problems and/or worse transfer efficiency. 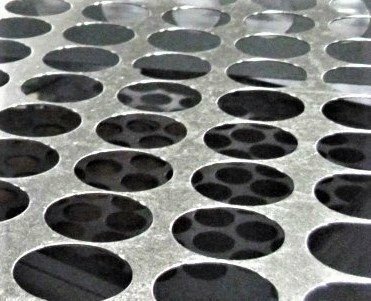 Powder coating particle size discrepancies can create issues with the quality of your finish and can increase your applied cost. These problems can be especially troublesome in a production environment, especially if you use a reclaim system as opposed to spray-to-waste. If you don’t reclaim and reuse spent powder, the particle size in the box is all you have to worry about. If you reclaim your powder, then you need to consider powder particle size even more closely. It’s likely you will have some adjustments to make to achieve your best finish. “Virgin” powder, straight out of the box, will typically be more conductive than reclaimed powder. The reason for this is that there are some large particles, as well as some inert particles that were part of the original powder formulation. These particles are most likely to fall off the part and get recycled back into the powder supply. As you use more reclaimed powder, this percentage grows and your powder does not adhere as well to the parts. Most powder experts recommend a ratio of at least 60% virgin powder to 40% or less reclaimed powder to get acceptable finish results. Remember, the fine particles will usually adhere to the part or get stuck in the exhaust filters of the booth, so it’s mostly the heavy particles (that are the least attractive to the parts) that get recycled. Some particles, even those of ideal size, will stick together due to contamination or partial gelling in hot environments. These clumps of small and standard particles act like large particles and don’t stick to the parts during spraying. It is important to hand filter all of your reclaimed powder or use an automatic sieve to filter reclaimed powder being pumped back into your powder hopper. What If I Think I Have A Powder Problem? If you think you may be having a finish issue that’s linked to a problem with your powder, always start by contacting your powder supplier. Powder coating vendors have access to tools that the average powder coating shop or finish line manager does not. Listen to your powder supplier and follow their suggestions. 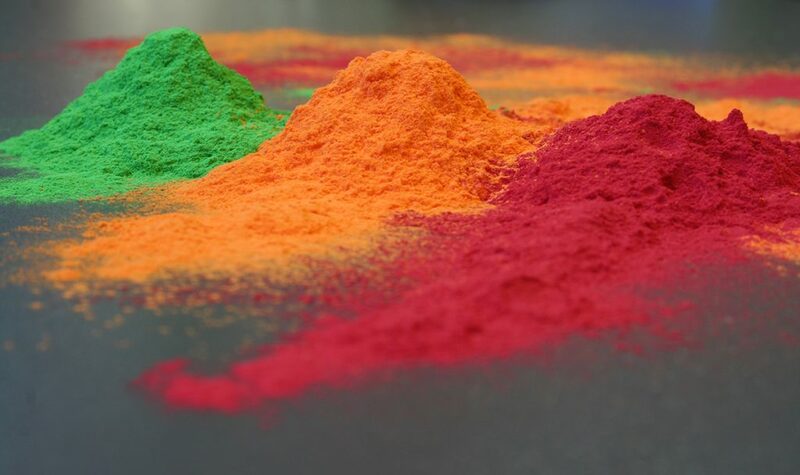 Don’t be shy about asking them to look into potential powder problems, but remember that most coating defects are due to process issues, not defective powder coating media. In a spray-to-waste environment, your supplier may elect to replace questionable powder or have it analyzed to confirm that it isn’t defective. It’s likely that they will want to review the way your using their product, and they may find a production issue that you’ve overlooked. If you do a lot of reclaim, your powder supplier can test your virgin and reclaim samples to let you know what you can expect from your powder as far as average powder particle size. By keeping good ratios of virgin and reclaim, you can adjust your guns to the appropriate settings to get repeatable, high-quality finishes. Reliant Finishing Systems is a U.S. manufacturer of high-performance powder coating equipment. 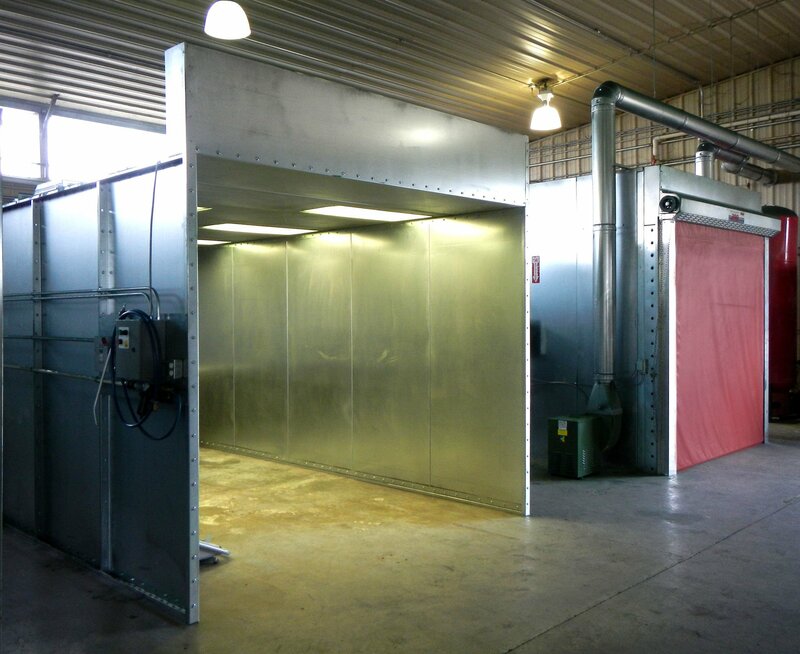 In addition to building powder spray booths and powder curing ovens, we manufacture blast rooms and wash stations. We also have experienced powder coating specialists on-staff and offer line audits and on-site troubleshooting. If you need powder coating equipment or expert advice, give us a call today. This entry was posted in News on January 30, 2017 by Bruce Chirrey. 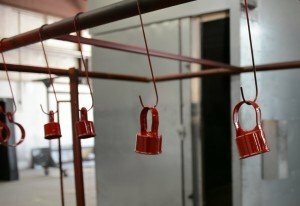 One of the key advantages powder coating has over other finishing processes is how safe it is for the environment and for the people who work with it. Unlike traditional solvent-based wet paint, powder coating is considered a “green” technology that doesn’t generate harmful solvents or airborne pollutants. 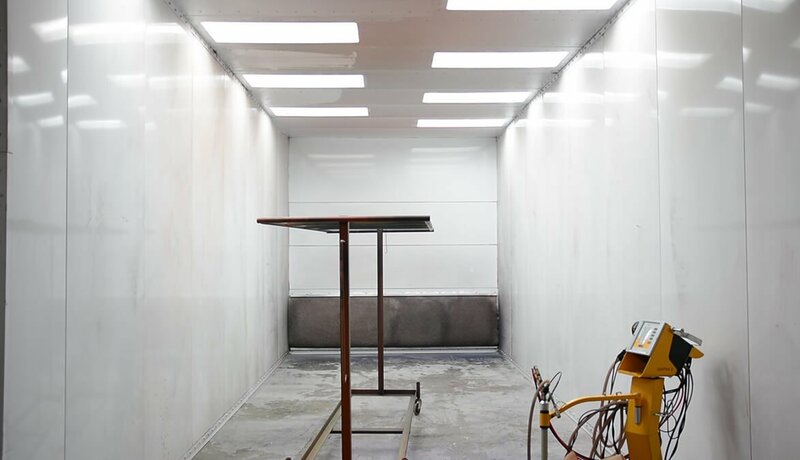 Compared to painting, powder coating reduces finishing line emissions, produces far less harmful waste by-product, and doesn’t pose a significant health risk to your employees or neighbors. Understanding the impact of these green benefits can help your business make the right choice when choosing a new finishing system—and help you gain support from your community. 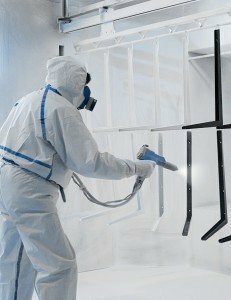 A significant difference between industrial wet painting and powder coating is the presence of Volatile Organic Compounds, called VOCs for short. VOCs (like formaldehyde) are released into the air over time, either as the paint is cured or as it ages. VOCs damage the ozone and, if trapped indoors, can cause serious health problems to people exposed to them. Traditional liquid paint emits VOCs. Newer paint technology includes No-VOC and Low-VOC products, but these are often not capable of providing a finish that is adequately robust. 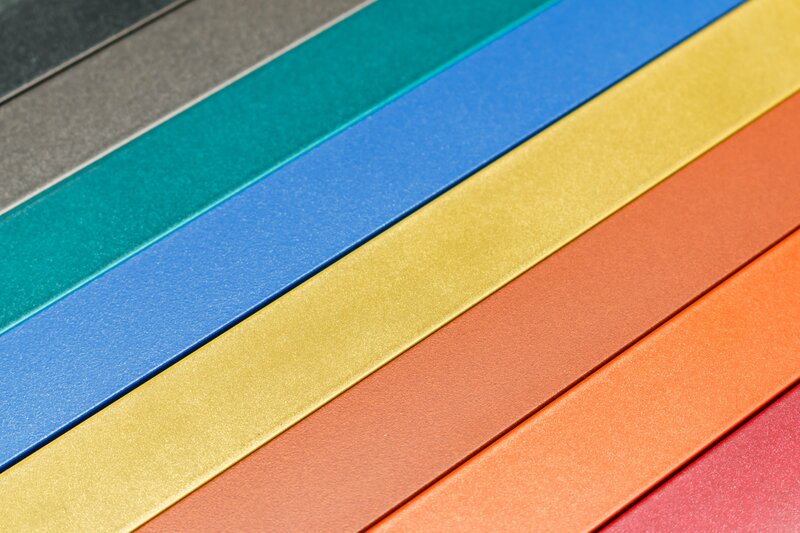 By comparison, powder coated finishes are tough and durable, yet cause the emission of almost no VOCs. 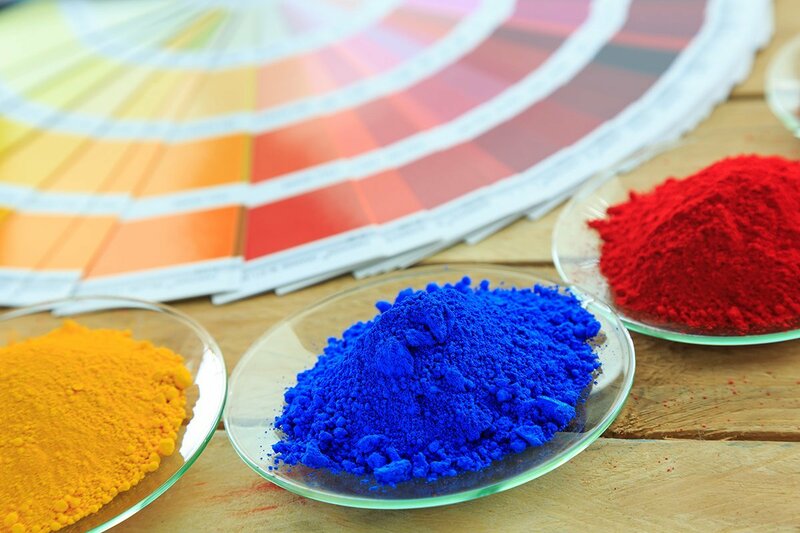 Powder coating media and powder coating in general is considered non-toxic, which it is why powder coating is strongly recommended if your finished product will be used or installed indoors. Since powder coating is inert and produces almost no VOCs, applying it does not create harmful fumes or contribute to air pollution. While you will still want to spray inside a booth with a true filtered exhaust including HEPA filtration, you won’t otherwise have to duct the air from your booth to the outside atmosphere. 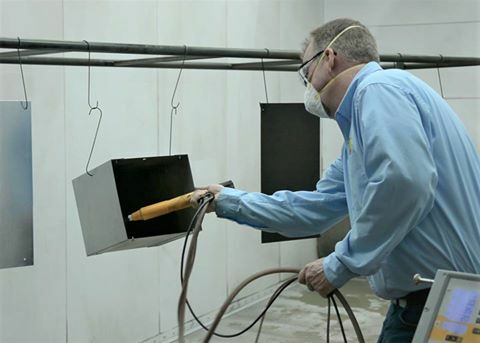 Although powder overspray is considered a nuisance dust, properly filtered exhaust from a powder coating booth is clean enough to breathe, so you don’t have to exhaust the booth outside the shop space. This makes powder coating even more energy efficient because you won’t be wasting heated or cooled shop air by exhausting it to the outside atmosphere. Traditional wet paint lines produce hazardous waste in two key areas: Retouching and Disposal. Because of the chemical composition of wet paint, coating defects often require costly reworks using solvents. These chemicals produce harmful fumes and the used solvents are considered hazardous waste. In addition, stripped and discarded paint may also be hazardous waste and should be disposed of properly – which can be an expensive and time-consuming process that many shops ignore. 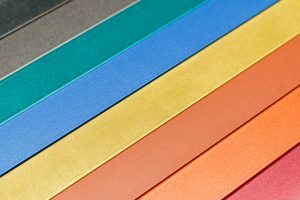 Since powder is considered inert and does not require special handling or disposal, powder coating media is much safer to handle and isn’t hazardous to retouch. Fixing a mistake is also much easier (provided you catch it before curing). Instead of using harsh chemicals, if you find a mistake on a powder coated part, you can simply wipe the part clean or used compressed air to remove the uncured powder and reapply it. Any waste powder can be swept up and handled without special safety equipment, and it can be discarded with normal shop trash. 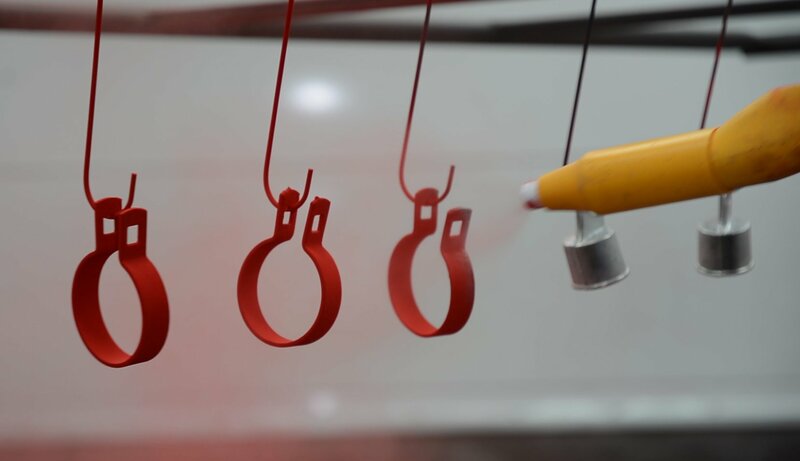 Powder coating is a two-stage process. First, your product is sprayed with powder using an electrostatically charged powder gun. The powder adheres to the part, but must then be cured inside a powder coating oven to melt the powder so that is flows together and locks onto the part. This process creates a strong and very durable bond that lasts and helps protect the metal underneath. (You can even increase this durability with different pretreatment methods – for more information on pretreatment, take a look at our Pretreatment Primer.) But what about the powder you spray that doesn’t adhere to the part? Because powder coating is considered non-toxic, is inert and produces negligible VOCs, it already meets or exceeds many national environmental protection standards. 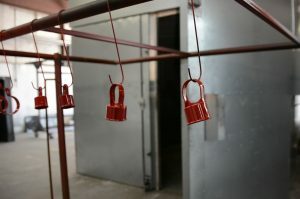 Although your shop will need to clarify with your local authorities, powder coating is considered safer and will not require the same level of oversight and waste disposal care that wet paint operations do. Also, because powder coating media doesn’t present a spill hazard, you don’t to invest in a paint mix room or storage room. As long as the powder coating equipment you purchase meets national safety codes, your operation will already meet or exceed national environmental regulations. If you’re looking for safe and effective powder coating equipment, look no further than Reliant Finishing Systems. 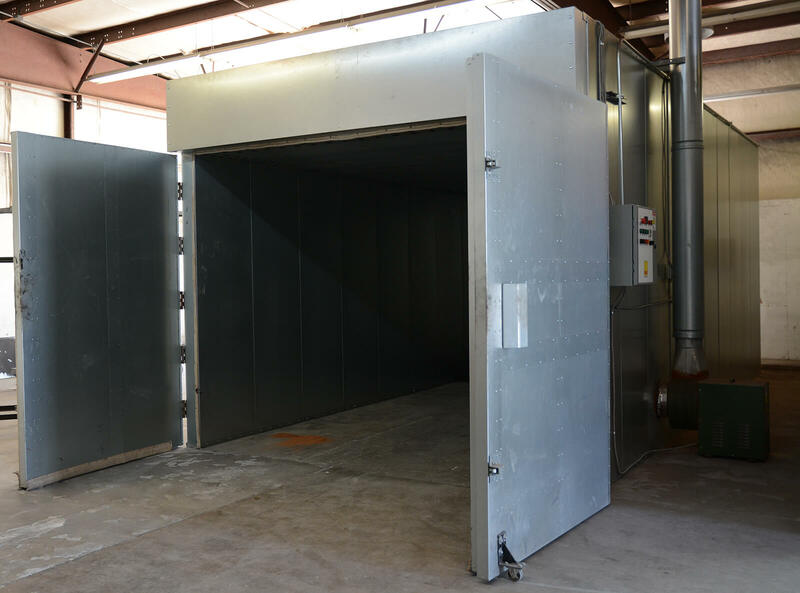 Our powder spray booths and powder curing ovens are designed specifically for powder coating applications and can be customized to fit your shop’s exact application. Whether you’re a finish line manager seeking a turn-key automated powder coating line, an established powder coater in the market for new equipment, or a fab shop owner wanting to get started with powder coating, Reliant can help. Have questions? Email us or give one of our systems specialists a call today or visit our Resources page. This entry was posted in News on January 23, 2017 by Reliant News. 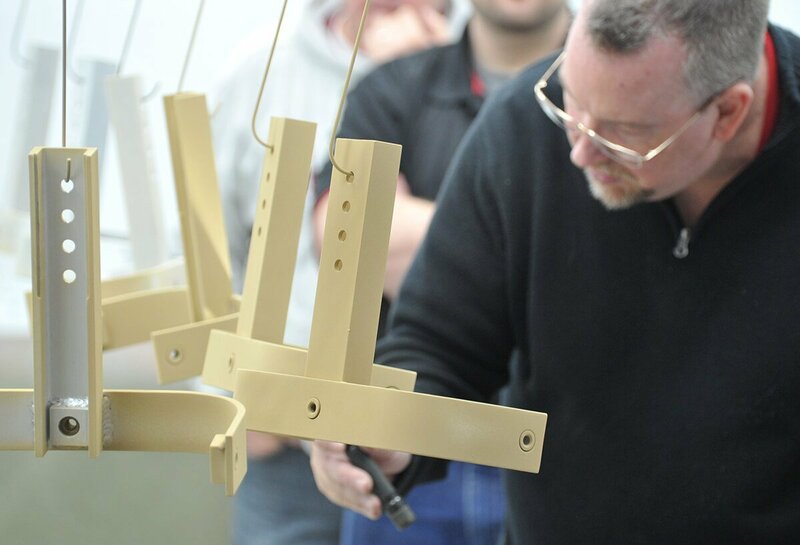 If you want to powder coat but aren’t sure where to start, our Beginner’s Guide to Powder Coating Equipment is intended to help anyone learn about the business of powder coating. Whether you’re just curious about professional powder coating or ready to install your first coating line, this brief overview will give you the basic information you need to get started. 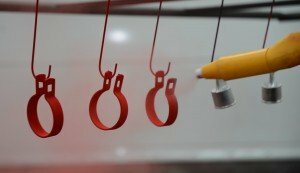 Powder coating is a multi-step finishing process. In the first step, a product (usually a metal part) is cleaned and prepared for coating. Next, it is coated with a fine powder. The powder covers the part’s surface. In the final step, the part is moved into a curing oven. The product is then heated in the oven, allowing the powder to melt and flow into a uniform coating that adheres to the part. This creates a very durable and attractive coating around the product once the melted powder cools and hardens. To achieve the best results with your powder coating process, your product needs to be clean—free of dust, debris, oil, rust, old paint or finish material. 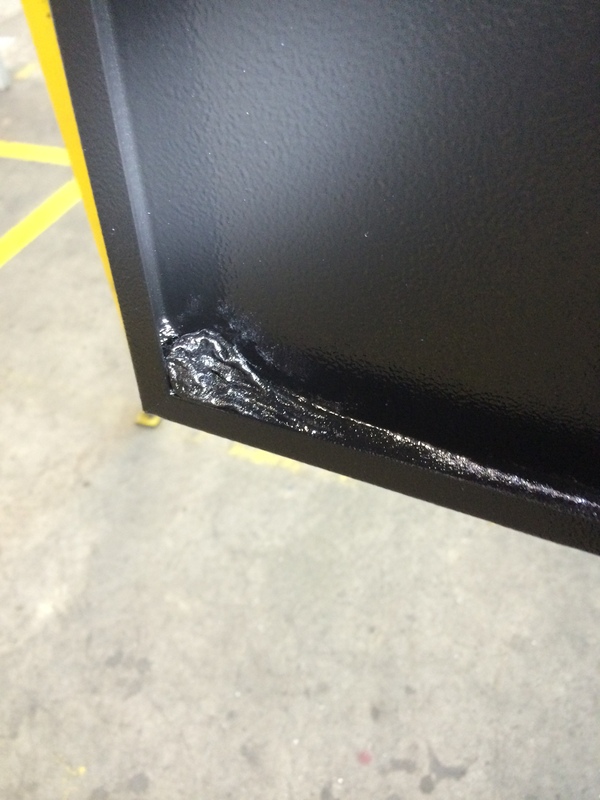 Anything left on your product prior to coating will affect the powder’s adhesion and durability. That’s where pretreatment comes in. If oils, solvents or chemical residue covers any part of your products’ surface, you’ll want to consider a Wash Station. A wash station is where you spray your parts with a detergent and/or chemical pretreatment agent, such as iron phosphate. Using hot water or steam to clean and then chemically prep parts is quite common. A wash station helps you increase powder adhesion and improve finish quality, even if the parts have already been blasted. Some wash stations require you to apply the chemistry manually using a spray wand. Other washers are automated and the parts travel through the cleaning, rinsing and prep stages on a conveyor. In some operations, pretreatment requires the use of a Dry-Off Oven. This is commonly an appliance similar to a curing oven, but where the just-washed parts are heated in order to evaporate any water or chemistry still on them. This step can also help parts reach an optimum temperature for powder application. 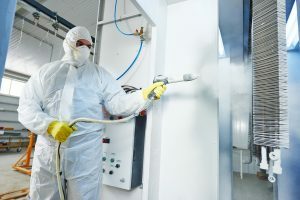 Pretreatment equipment is incredibly useful for your operation and can make a big difference in the quality of your work, but an elaborate system isn’t always required for powder coating. While we can’t stress how important it is to have a clean surface before you apply powder, expensive pretreatment equipment isn’t mandatory for entry level coating operations where hands-on cleaning (such as with a tack rag and solvent) can be employed as needed. Powder coating application is almost always done with a special Powder Spray Gun. In order for powder coating to work effectively, the powder must be electrostatically charged. The only way to apply this charge is with a spray gun designed exclusively for powder coating. 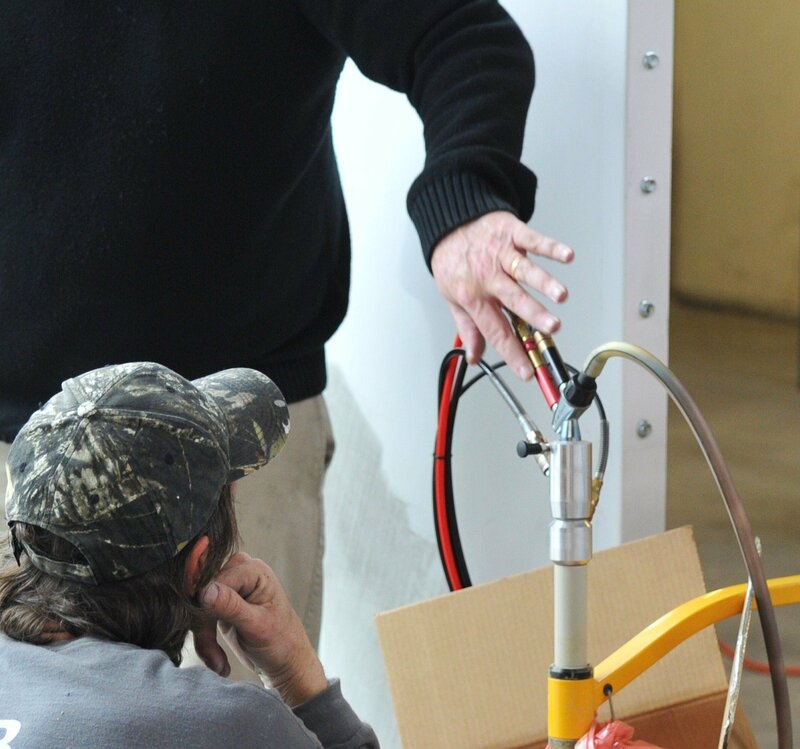 Compressed air moves powder through the gun from a hopper or directly from the box the powder is stored in. The compressed air blows powder out of the gun as a tightly formed cloud. As the powder leaves the gun, it receives an electrostatic charge. 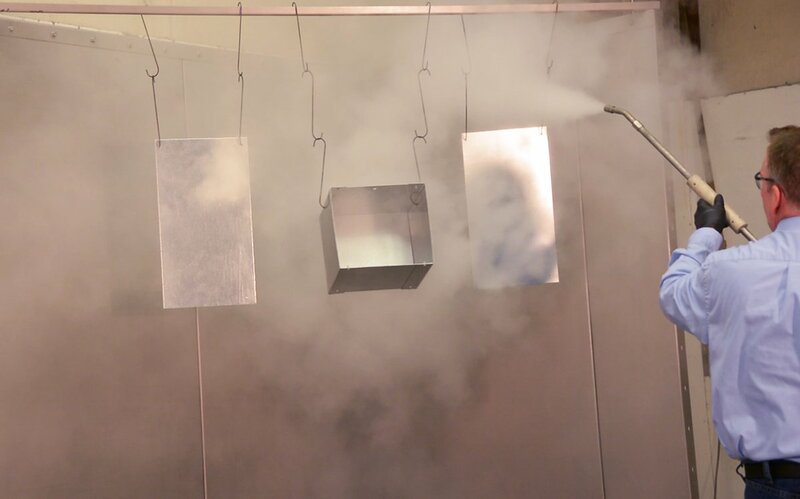 Once charged, the powder cloud envelopes the part and the powder sticks to the surface of the grounded part (which is one of the reasons why powder coating equipment is so easy for new operators to use). If you want to powder coat, you need a powder coating gun. There are many types of powder spray guns available on the market. We always recommend investing in a professional-grade powder gun, as they are more reliable and provide better results. Once you have your powder gun, you’ll need to have a place to use it. Whenever you spray powder, some of the powder will end up on the floor and in the air instead of on your products. This leftover powder is referred to as overspray. Keeping this overspray out of your workspace is one of the functions of the Powder Spray Booth. The powder spray booth is designed to keep the rest of your shop clean while providing a well-lit area for you to apply powder coating. All powder spray booths will have one or more exhaust fans. The exhaust will use filters to capture at least some of the overspray. If the exhaust works properly and the filters are maintained, the airflow in the booth should keep the overspray inside the enclosure and enable the painter to see what he’s doing. 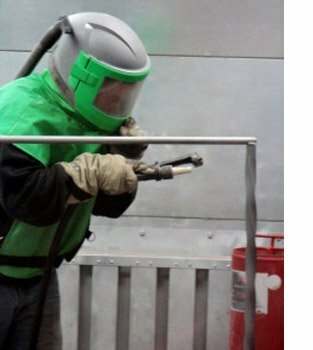 If your shop environment includes welding or blasting areas, filtered doors on the spray booth can keep airborne contaminants out of your powder coated finish. Numerous booth configurations are available, and getting the ideal booth depends largely on what you’re coating, your floor space availability, and your workflow requirements. Powder spray booths can be open-faced or have doors on one end. They can also be tunnel style enclosures with the filtration built into the floor or wall(s). If you have space constraints, a Powder Spray Wall may help you get the airflow and filtration you need. 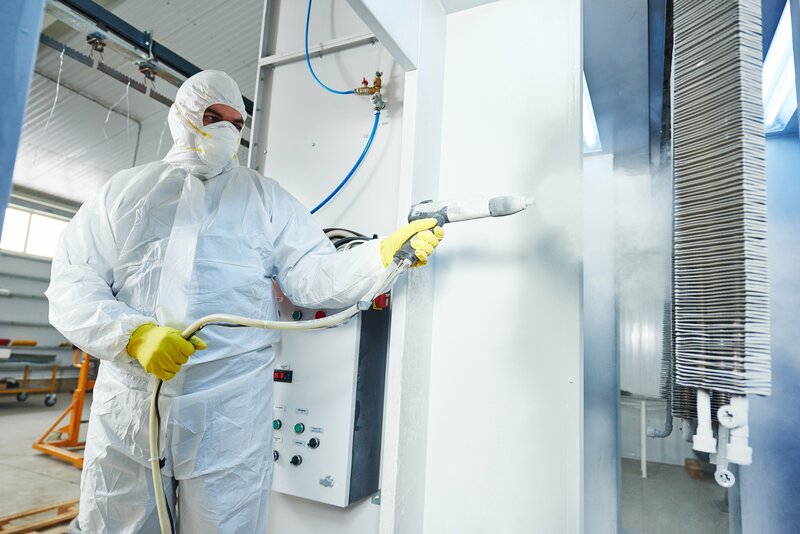 A spray wall is just a large filtration system—essentially a spray booth without walls or a roof. If you want to recycle your powder, you need to make sure your powder spray booth is built with a reclamation system. Usually this system will rely on pleated cartridge filters. These help you recover some of the overspray and reuse it. 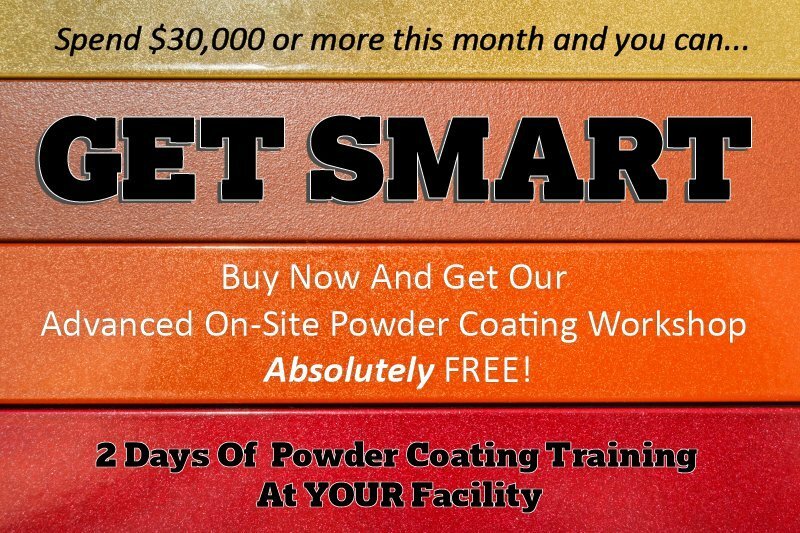 This can be very cost-effective if you are planning to use only one color and type of powder for your coating. The spent powder is trapped in the filters and then dislodged into a recovery bin for reuse. In more advanced systems, the powder is automatically reconditioned, mixed with virgin powder, and then returned to the supply hopper feeding the powder gun(s). If you are planning to reclaim a variety of colors, a set of removable filter modules is required. Unfortunately, the cost of buying multiple reclaim modules can add up quickly because you can only reclaim one color in each filter module. After your product is powder coated, the final step is to place it inside a specially designed Powder Curing Oven. They usually operate between 325° and 450° Fahrenheit. Once the oven is up to temperature, the temperature stabilizes. The coated products are exposed to precisely heated air for a set period of time. Once the curing process is complete, the parts are removed and allowed to cool before being handled. 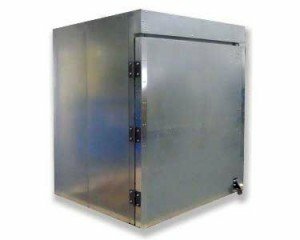 Some ovens use infrared emitters to heat the surface of the coated parts, but these types of electric powered or gas catalytic ovens can be costly to buy and expensive to maintain. More commonly, ovens rely on electric heating elements or a natural gas or LP-fueled heat system. These more conventional ovens typically rely on heated air moving over the parts for convection curing. The time it takes to cure the powder varies greatly depending on the size, shape and thickness of the parts being coated. A small, light-gauge bracket can take as little as ten minutes to cure completely, while a 20’ section of heavy-walled pipe may take over an hour to cure properly. If you want to powder coat at a professional level, the type of oven you choose is critical. Not only are brand-name powder curing ovens designed specifically to generate premium coating results, they are also highly efficient appliances in terms of fuel usage and energy costs. It’s likely that you’ll be using your oven several hours per week, so the cost of an inefficient design can quickly sap your profits. There are two basic configurations for any powder coating line: batch or automated. 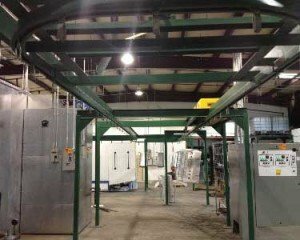 A Batch Powder Coating Line is usually a system where the parts are prepared, coated and cured in batches of multiple parts, with operators handling up to dozens or hundreds of parts at a time. The products are usually hung on metal rolling racks, which move with the parts throughout the coating process. (Remember: high-temperature or metal casters for your racks are very important!) With a batch line, parts are usually moved from stage to stage manually, and the term “batch coating system” is also commonly used to describe operations where large objects are coated individually after being moved by hand or with machinery. An Automated Powder Coating Line uses basically the same appliances as a batch system, but connects many or all of the stages via a motorized conveyor that moves the parts through at a constant rate. The products are usually loaded onto the conveyor at a set location and move through each stage, where either manual operators or automated devices clean and prep the parts and apply powder to them. Once coated, the parts move through the curing oven and then cool as they travel along the conveyor to a point where they can be unloaded. Hopefully this Beginner’s Guide to Powder Coating Equipment has answered your basic questions about what powder coating is, how it is done, and what you need to start your first powder coating line. If you would like to learn more, please give us a call at (888) 770-0021. Reliant Finishing Systems’ specialists can help! We’ll guide you through the process of setting up a powder coating shop or adding coating capabilities to your existing fab shop or manufacturing facility. Whether it’s your very first powder coating system or you’re upgrading to a complete automated line, you can trust Reliant to provide you with sound advice and affordable, high quality equipment. This entry was posted in News on December 9, 2016 by Reliant News. 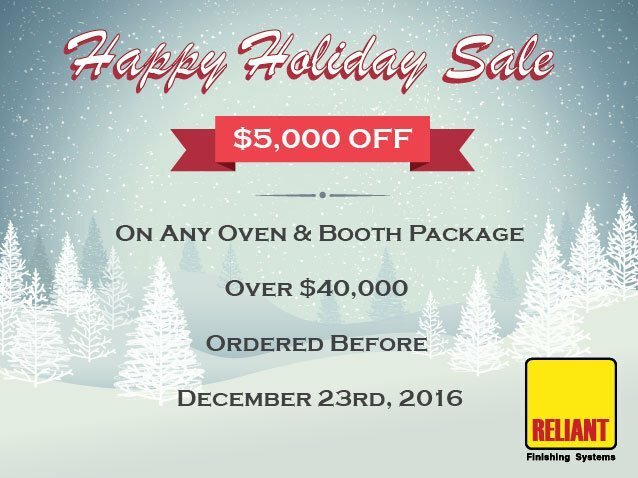 From now until December 23rd, save $5000 on select powder coating booth and oven packages. Don’t wait! Call us toll-free at 888-770-0021 today! This entry was posted in News on December 6, 2016 by Reliant News.